An evocative art installation remembering the thousands of servicemen from the Ulster and Irish regiments, or from Belfast, who died in the Battle of the Somme and have no known grave was unveiled at Belfast City Hall today. A total of 3,775 shrouded figures – each one representing an individual serviceman – have been laid out in the Garden of Remembrance. Artist Rob Heard and Lord Mayor Deirdre Hargey unveil the Shrouds of the Somme art installation in the Garden of Remembrance at Belfast City Hall. The powerful ‘Shrouds of the Somme’ installation, which is the work of English artist Rob Heard, highlights the huge number of individuals in unknown graves and is designed to help people truly understand the incredible scale of the loss of those who gave their lives in the Great War. She spoke about some of the men from Belfast who made the ultimate sacrifice at the Somme and have no known grave, and went on to urge people from across the city and beyond to visit the Garden of Remembrance over the next few weeks. “The Garden of Remembrance and cenotaph was probably the right choice for this exhibition as it does have a massive impact on you as a person and just gets you thinking about the history of 100 years ago whilst also reflecting where we need to move to as a society,” she said. Echoing that call, DUP Councillor Lee Reynolds, who was instrumental in bringing the art installation to Belfast, commented: “Every soldier who served in a Ulster or Irish regiment with no known grave, and anyone that we can identify with a Belfast address in other regiments, is listed on the display, so families can come here and find the name of their relative and know that they are represented here. Mr Heard painstakingly hand-made each shrouded figure in memory of an individual whose name is carved on the Thiepval Memorial. “It’s been a four-year process, and that’s an every day four-year process. I have done every bit of it and I think it is important that one person has done it. It’s all hand-sewn, hand-cut, every part of it,” he told the News Letter. “The relationship of each one with a name is key – that is absolutely everything. They are not just randomly named. Each figure represents a person and I read the name out as I made each one. 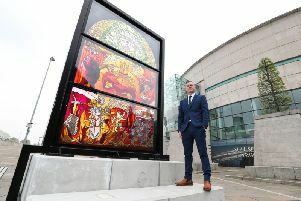 During the launch event, the artist presented a book containing the names of the 3,775 Irish soldiers represented in the exhibition to Belfast City Council. The free ‘Shrouds of the Somme’ exhibition will be open to the public from August 23 - September 16 (7am - 9pm daily). The Belfast installation is part of a larger piece totalling 72,396 figures, representing men from across the Commonwealth who died at the Somme and have no known grave. All the figures will be laid out, shoulder to shoulder, at Queen Elizabeth Olympic Park in London in November to mark the centenary of the Armistice. Meanwhile, as a lasting legacy of the project, relatives of those who lost their lives at the Somme are being invited to share photographs and stories of the men, telling who they were and where they came from.